This is my WIFI switch. It controls power to the device. Just a double gang box with a switch and incandescent pilot light. Where did you get that green pilot light? Nifty, also works pretty well for when you inevitably have to power cycle the modem and router to fix some wifi issues. 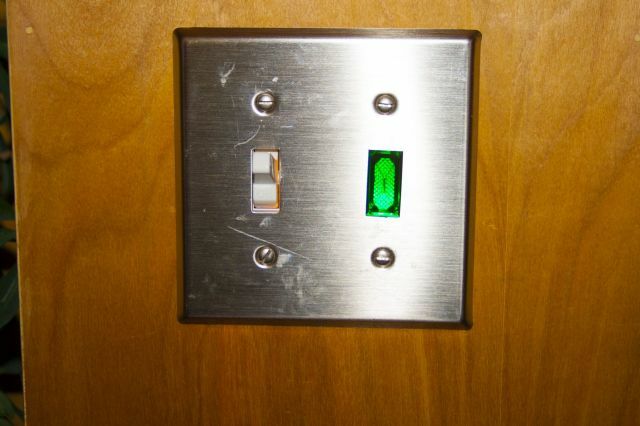 @lightinlover : I got it online from Kyle switch plates. They now have, in addition to the red and green, amber and clear. @joseph : Yes, very handy for that although it doesn’t happen very often. This one has been converted to LED because the incandescent lamps only lasted about five months. I use one I got from Amazon in S6 shape.